Bill completed the Ballymaloe 12 Week Certificate Course in 2010 and explains why he chose to do the course and what he is up to now. I did the September 2010 course, I had done a couple of short courses and decided that the 12 week was the one for me. As I was likely to face redundancy the time was right to get new skills and prepare for a new career. Eventually I got my redundancy and took some business courses to prepare myself for setting out on my own, and some further courses in baking, notably with Richard Berthinet. I run a micro-bakery from home, offering a range of organic breads and also some sourdoughs – I have a starter from Declan Ryan of Arbutus Bread, and the amazingly popular Soda Breads for which I use only Irish ingredients including the buttermilk which I buy and then freeze on our regular trips over. 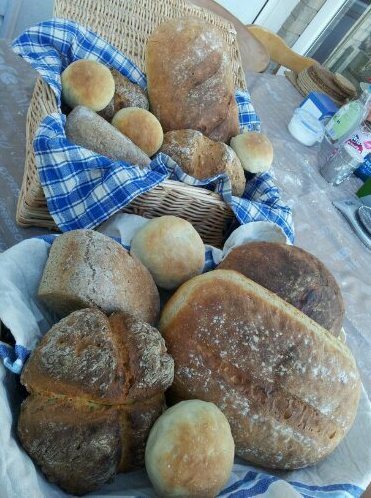 My breads are available at the monthly Llanyrafon Manor Market, and I have a regular weekly client group as well. I also teach small baking classes at home. I have been pleased to get involved with some community groups teaching bread making and with our local community farm where I do Pizza making with mums and children. Best of all I have done some hands on demos at our local Newport Food Festival. The practice of baking regularly at Ballymaloe reignited my interest in breads and the business classes persuaded me that I could do something for myself afterwards. After a year I am now moving into a shared unit and will put in two smallish ovens to cope with increased demand and to supply a catering company on a regular basis. 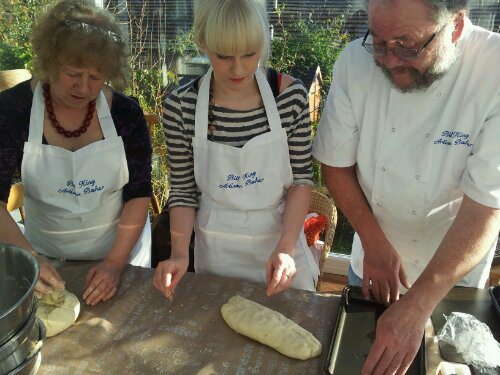 The most helpful part of the course was the support from the teachers, without which I would not have gained the confidence to bake as a profession.